Although October is Bullying Prevention Awareness Month, conversations about bullying and friendship with your daughter should be ongoing throughout the year. With an open dialogue, you will have a better sense of the social landscape she is confronted with daily and how she perceives and handles different situations. You might even have the opportunity to stop bullying before it starts. Not sure where to begin? Worried that this topic could make for an uncomfortable conversation for you and your daughter? Try these smart ways of getting the conversation started, and be sure to check in with your daughter off and on during the year to see how things are going. 1. Explain what bullying is, including what it might look and feel like. Don’t wait until your daughter has witnessed or experienced bullying to talk to her about it. Instead, be proactive—go ahead and have that conversation, so that she recognizes the behaviors and is better prepared to deal with it. Explain that bullying can be physical, verbal, and even relational. Bullying can occur both in person and online. Especially with younger girls, share some specific examples—punching and hitting are more obvious bullying actions, but teasing and name-calling can also be taken too far. How do you know when things have moved into bullying territory? When the behavior is repetitive, is targeted at one person, and makes them feel bad. Excluding someone from an activity on purpose, spreading rumors, or writing negative things (even posting unflattering pictures) on social media are all forms of bullying. Instead of starting by asking your daughter directly about her own experiences, ask her if she has ever seen these things happen at her school. Ask her what happened and how the situation made her feel. Even being a witness to bullying can cause anxiety for children and make them feel helpless and/or guilty. Encourage empathy by asking how your daughter thinks the bullying victim might have felt. Was the situation resolved? Acknowledge her feelings and consider sharing a story about your own childhood—or even one from your adult life—in which you might have experienced or witnessed bullying, and how you got through it. This will help her realize she is not alone and that you are open to talking about bullying and other potentially challenging topics. 2. Encourage open communication and sharing. Pick the conversation back up in the car on the way to sports practice, while doing backyard chores, or even during a walk. Continuing the conversation signals to your daughter that this is a topic that is important to you, and that it’s always OK to come to you if she feels like she or a friend is being bullied. It also allows you the opportunity to hear if something new or different has come up—for example, if bullying isn’t happening at her school but is happening elsewhere in her life. 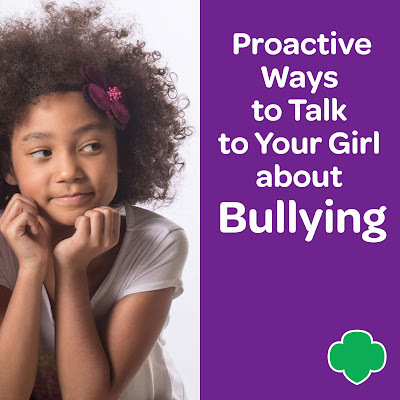 Talking about bullying and other challenging themes while keeping busy on a car ride or with an activity may also feel less intimidating than “sitting down to talk about bullying.” It might allow your daughter to open up in more detail about situations that are occurring and her feelings about them. Reinforce that there is no need to feel embarrassed about being a victim of bullying or even questioning whether or not it is occurring. Also, do your best to keep open lines of communication with other parents in your community, and with teachers, administration, and staff at your daughter’s school. During parent-teacher conferences, ask about the social climate of the class and if the teacher has witnessed any bullying behavior. If your daughter has experienced something you haven’t brought to the teacher’s attention yet, be sure to do so. Schedule some time with administrators at school or key community leaders to see if they have bullying-prevention programs and policies in place, so that if a problem does arise there is a plan to help resolve it. 3. Ask her what she thinks she could do to help stop bullying behavior. Help girls feel like part of the solution, instead of only focusing on the problems. If she’s ever witnessed a bullying situation, what (if anything), did she do? Acknowledge that it’s often hard to watch a bullying situation and even harder to know how to step in to stop it. Many kids worry that if they stand up to someone picking on another, that person will turn their bullying behavior on them. More often, though, if just one person stands up to the perpetrator in a simple way—by asking them to “stop it” or to “cut it out,” or even by diffusing the situation with a joke or saying to the victim “let’s get out of here”— the perpetrator stops. Confidence can be disarming. Also, let them know that adults in the school or community should also be seen as resources for help. Children often worry about being seen as a “tattletale” if they go to get help in a bullying situation. Explain that there is a difference between “telling someone” and “telling on someone.” When you are telling someone, your goal is to get help. When you are telling on someone, the goal is to get someone in trouble. Take it further and ask your daughter how she thinks she might be able to stop bullying behavior in her school or community and what she thinks it means to be kind. Engage in open dialogue, and share some ideas of your own. You can even brainstorm a cool new initiative, program, or game she can start with to help educate others, increase the kindness, and minimize bullying in your community. Focusing on creative solutions is empowering for girls and ups the fun! Do you suspect your daughter is experiencing bullying? If you gather from your conversations or other changes in your daughter’s behavior that she might be experiencing bullying, you may feel angry and protective and want to get as much information as possible, right away. However, to allow your child to feel safe, and to get the information you want, it’s often best to start the conversation in a subtle way. Ask about her favorite friends in class or who she sits with at lunch. Ask what they talk about and if everyone feels included. Are there kids she prefers to not spend time with or whom she avoids? Why or why not? As parents, we do want to respect our kids’ friendship choices, but there is a big distinction between not having much in common with someone and being teased and picked on because of those differences. Acknowledge that there are too often times when people don’t treat others kindly—even as adults. Ask her if she has ever experienced unkind treatment from others and if it happens regularly and from one particular or a few classmate(s). Ask her how she feels during these times and what if anything she has done when she has experienced bullying. Acknowledge that being picked on, hurt, or excluded feels awful to all of us. Praise her efforts, however small, to stop the situation. Avoid making her feel like she did the “wrong thing” or calling the perpetrator or their behavior a negative name—despite best intentions, this rarely makes girls in this situation feel better. Listen in a calm and nonjudgmental way when discussing both your daughter and the potential perpetrator. If your daughter sees you becoming increasingly upset as she shares, she may shut down for fear that she is making you upset or that you might escalate the situation in a way that makes her even more uncomfortable at school. Even if she is young, ask her how best you can help her resolve the situation and come up with potential solutions that you can even practice at home. These could include saying something, walking away, or contacting the school if the situation seems more extreme. If your daughter is concerned about your contacting the school, let her know that your job is to keep her safe and that in doing so, you might be keeping other children safe, too. While she may feel singled out and alone for being picked on, it’s likely that other kids may also be experiencing this perpetrator’s bullying behavior. Assure your child that you will approach a teacher or school administrator in a way that doesn’t threaten her safety or call attention to her.